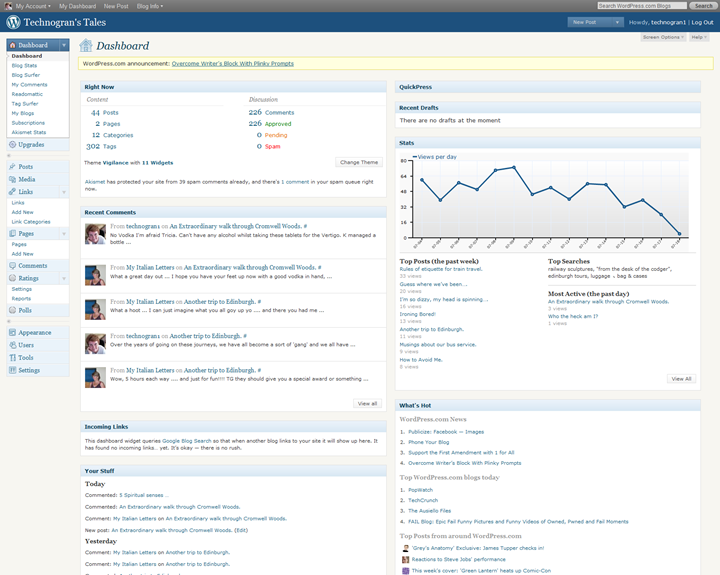 Beginning Blogging 8. the WordPress Dashboard. Just as with the Blogger Dashboard, the WordPress Dashboard is where you have total control over all the settings for your blog. At first glance it can appear quite daunting to a newbie because their appears to be a lot going on on the one page, but just take your time to familiarise yourself with the layout (which can be altered by the way) Because these posts are for anyone new to blogging, I intend to only concentrate on those areas that someone new needs to familiarise themselves with, so let’s take a look shall we? The main area of your dashboard contains the following ‘modules’ which can be clicked and dragged around on the Dashboard page so that they appear as you prefer to see them. Firstly at the top you have Right Now, Quick Press, which allows you to do a very quick post to your blog, Recent Comments, Recent Drafts, Incoming Links (when anyone has linked to your blog) your Stats shown in a Graph form, What’s Hot (the most popular blogs on WordPress at the moment for you to read including the latest one’s recently posted) Your Posts this past week, the Top searches made on your blog and your most Active posts the last day. Its’ a lot of information to take in at first. Each module can be enlarged by clicking on View All. All the listed blogs in What’s Hot can be clicked on and you will then be taken to them so that you can read them and follow them if you wish. I can’t cover everything about the dashboard in these how-to’s so I am simply going to concentrate on those areas that a newbie to WordPress might need to change and alter. On the left hand side of the dashboard is a sidebar which contains all of the features and settings that you need to be able to access for your blog. Right at the bottom of that list we have Settings. So let’s set those up now. Click on Settings, and a drop down list will then appear containing all of the settings that you can change. The first setting is General and here can set up the following, the Blog Title (which you can alter) the Tagline ( a very short summary of what your blog is all about) the email address to be used by admin and for comment notifications etc, your Timezone, your preferred Date Format for your blog posts, your preferred Time format and when you prefer your week to begin. On the right hand side you have to option to include either a photo of yourself or an Avatar to be used on your blog and also around the WordPress site such as when you comment on someone else’s blog post. If you upload a photo, you can crop it once its uploaded. When you are happy with your chosen General settings, click on Save Changes. The next setting of Writing concerns your settings for the online WordPress blog editor and for most users this can be left at its default settings. The Reading settings mostly concern how you prefer your home page to appear to your readers. Which posts do you prefer to show on your Home page, do you prefer your latest post or a static page such as About or any other page you have composed? This is followed by how many Blog pages you prefer to show, how many recent Syndication feeds and whether or not to show the full text of a feed or just a summary for each article in an enhanced feed. What type of feed do you want to show, Categories, Tags, Comment Count (default) Add to Stumbleupon, Add to Del.icio.us, Add to Digg or Add to Redit? (most new users won’t need to alter this area at all) and finally your Email settings. If someone subscribes to receive an email whenever you publish a post to WordPress, you can change the message that they recieve as they subscribe. As soon as you are happy with any changes you have made, click on Save Changes. The next area under Settings is Discussion, and its this area where you can change any settings for the comments made on your blog posts. The Default article settings can be left at their default settings, then next comes your rules for any comments and you can choose here whether the person making a comment has to fill our their name and e-mail address or have to be registered on WordPress in order to make a comment. You can also choose what days you wish the ability to comment on older posts to be set at, how deep you wish your threaded comments ( i.e comment, reply,etc) to be set at, whereabouts on a page you wish your comments to continue on another page (only applicable if you get lot’s and lot’s of comments of course!) Do you want to show the last page of comments last or first, and whether you prefer your comments shown with the oldest or newest at the top. Next you can choose whether you wish to receive an email when anyone posts a comment and/or a comment is held for moderation and also do you want to always approve a comment or can the comment be allowed if you have approved it previously. Comment Moderation (for catching any Spam comments) allows you to change how many links it can contain in order to be held as Spam and to stipulate any comments you want to filter out as Spam. You can also Blacklist any comments by content such as an URL etc. Comment reply via email, subscribe to comments and subscribe to blog can all be included in your comment form and its a good idea to leave these three choices ticked. Lastly you can choose whether you prefer other users avatars to be displayed whenever they comment on your blog and if they do not have an avatar on WordPress, you can also choose which default Avatar to display instead for those users. When you have set up everything for your comments area, click on Save Changes. Next in the list of Settings comes Media. This can be left at its default settings by most new users so next move onto Privacy. Who do you want to be able to access your blog? Everyone including any search engines such as Google, Bing etc, or would you prefer to block search engines but let normal visitors access your blog? Is your preference to keep your blog posts entirely private? Click on your preferred choice and then click on Save Changes. I don’t intend to work through the OpenID, Domains and Webhooks area here as most users won’t need to change the default settings in those areas. So that’s all of our ‘newbie’ settings finalised. Next post, we’ll take a look at Appearance where we’ll change our chosen theme, add a header of our own and a new background image to really make our blog look unique. 5 Responses to Beginning Blogging 8. the WordPress Dashboard. Is there any way to get all of my blogs on one dashboard? I have tried the transfer blog and add a user avenues, but to no avail. Am I doing something wrong or can you just not do this? In fact, the transfer blog avenue was a disaster, since all my content from one blog got added into another and I had to delete all the unwanted content to restore my blog to its original state. At the moment, I have two blogs on one dashboard and one blog on its own dashboard. I would just like to get all three blogs on one dashboard. 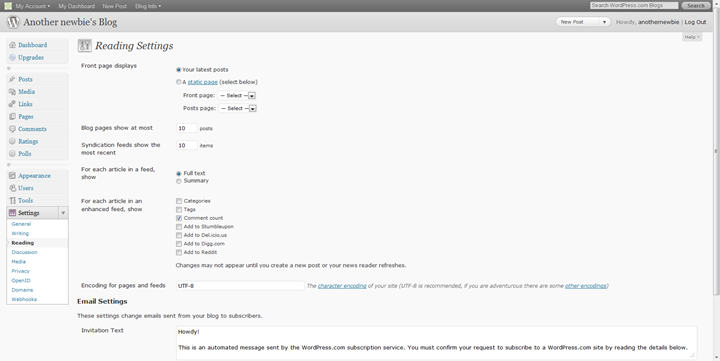 ask judge, WordPress dashboard should show all of your blogs under ‘my blogs’ from the sidebar. However, they are not presented in the same way as they are in the Blogger dashboard. Maybe you should suggest this feature to the team on the forums? Life is not perpetual. Of course, this is a common truth, but do we always remember about it? How can we feel the value of life staying at the same place? They say if you don’t like the place where you are – move, you’re not a tree after all. By the same rule, I want to say that traveling – is an important component of happy life. Let’s not waste life in vain but explore this wonderful planet! It remains to start moving, just click world’s wonders and you will see all the riches of our world which are near to us. Very often various park complexes are just round the corner, but we can’t find time for knowing the world. begin reading not fashion journals but brochures with natural landmarks. A famous poem says “What is this life if, full of care, we have no time to stand and stare…” Let’s change our life!